My colleague's baby turns one month ago this week. 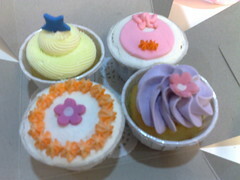 As such, he gave us all in the department some cupcakes as a celebration. They looked really cute and are delicious as well. I finished three of them alone.. Opps, I think I may need to go on a diet soon.